PASCAGOULA, Miss., Oct. 10, 2005 (PRIMEZONE) -- The commanding officer and crew of Forrest Sherman (DDG 98) moved aboard the 23rd Northrop Grumman Corporation (NYSE:NOC)-built Aegis guided missile destroyer on Friday, and were recognized for supporting the company's recovery efforts following Hurricane Katrina. "If it had not been for this ship, this shipyard would not be in the shape it's in today," said Teno Henderson, vice president of the Aegis destroyer program at Northrop Grumman's Ship Systems sector. "This was truly the command center for bringing this shipyard back to life. I would like to congratulate (U.S. Navy) Cmdr. Michael Van Durick (the ship's commanding officer) and his crew for the many hours we spent on and off this ship, and their help in getting our shipyard back in order." 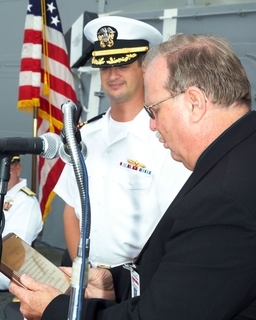 Many Northrop Grumman employees, including Corporate Vice President and Ship Systems Sector President Philip Teel, lived on the ship while the company's Gulf Coast facilities were recovering from Katrina. Company executives and facility managers utilized the ship's berthing areas, mess decks and office spaces to asses the hurricane damage and establish the plan to move forward to recovery. "This ship stood up against the strongest winds that Mother Nature could muster and in turn, she became a beacon of hope for this shipyard when the winds died down," said Navy Capt. David W. Bella, supervisor of shipbuilding, conversion and repair for the Gulf Coast. "Forrest Sherman became the hub of the recovery effort here in this yard, providing a refuge to some, hot meals to many more and the planning center to get this shipyard back on its feet. By getting this yard functioning -- the economic engine of the coast -- Forrest Sherman has already completed her first humanitarian mission. She is already serving our nation and she hasn't even left the builder's yard." "The ship's motto, 'relentless fighting spirit,' in the wake of Katrina has acquired new and tangible meaning," said Van Durick, a Scranton, Pa., native and a graduate of the U.S. Naval Academy. "It is through the relentless fighting spirit of the Northrop Grumman shipbuilding team, the supervisor of shipbuilding team and the efforts of our crew, that less than five weeks after the impact of Katrina, we are moving aboard and making the transition from an industrial production to a Navy operation." DDG 98 is the 23rd Aegis guided missile destroyer of 28 contracted to Northrop Grumman Ship Systems. The 509.5-foot, 9,300-ton Forrest Sherman has an overall beam of 66.5 feet and a navigational draft of 31.9 feet. Four gas turbine propulsion plants will power the ship to speeds above 30 knots. DDG 98 will be crewed by approximately 383 officers and enlisted personnel. DDG 98 will undergo final preparations at Northrop Grumman over the next two months and will depart the shipyard in mid-December. She will be commissioned in early-2006, in Pensacola, Fla.